If you have been binge watching the latest season of Orange is the New Black, you may have learned an interesting bit of trivia, courtesy of the Martha Stewart/Paula Deen-inspired new character of Judy King, who mentions that Wonder Woman creator William Moulton Marston (1893–1947) had “two wives” simultaneously. As explored in Jill Lepore’s The Secret History of Wonder Woman, Marston married Elizabeth Holloway in 1915 and had two surviving children with her; Marston also lived in an extended relationship with Olive Byrne, by whom he had two more children, who were then adopted by William and Elizabeth Marston. This last example would not work if you were using Microsoft Word’s “auto-numbering” system; only the first two examples would. 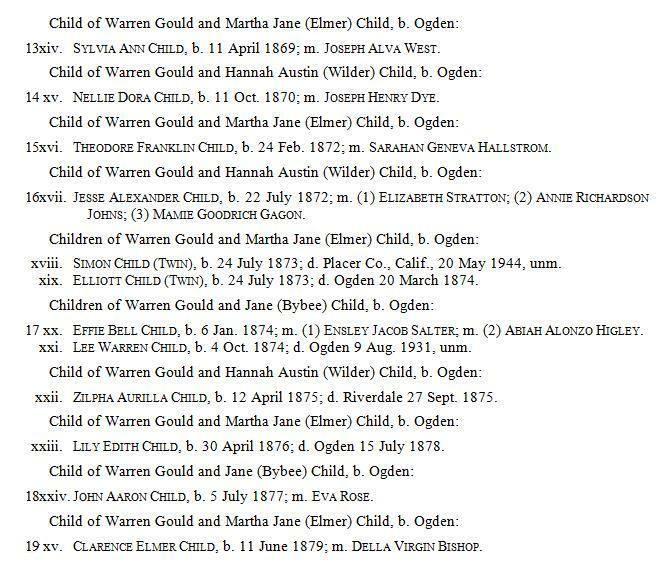 To give a more extreme example, I’ll show this in terms of nineteenth-century polygamy within members of the LDS church. My fourth cousin four times removed – Warren Gould Child (1835–1906) – had reported on the genealogy of the Utah Childs for the 1881 Child genealogy. W.G. Child had twenty-five children with three of his four wives, of which eighteen had children themselves. Below are how the families would be presented in Options A, B, and C.
I’m curious what readers think of the three differing presentations. For some reason, the first way does not bother me, even though the last born child has a lower number than the earlier born children. I guess that’s because I look to those numbers only as being a way to find the next generation in the book/report, and rely on the birth dates of the children to guide me as to proper order. But if you didn’t know the birth dates, I could see that as being a problem. So I guess my preference would be the first alternative, where the children are numbered and listed in order of birth under their correct parents. That way you’d know the birth order even if a complete birth date was not available. Yes, and which woman was the mother of which child. A never ending problem sometimes. So true. I have found censuses that list the wives and then all children. Church records don’t necessarily reflect this, and I’ve found misattributions, especially where a wife has died. After polygamy was supposedly abandoned the “extra” wives sometimes appear as boarders with children or the children were all together, I imagine it depended on the enumerator. Even tho the 2nd option is the longest, it’s easiest to follow both in terms of order and mother. I find all of them awkward in one way or another. It depends on what you are primarily looking to demonstrate: the relationships of children to mother, or relationship of children to father (which suggests a point of view about values, too- and not one to dismiss too lightly). Also, in some Mormon families, children lived with mother as separate families; in others it was a group situation, with children sometimes thinking of other wives as mother, sometimes not. I have found both in what I call my family’s “Mormon era”. There were other interpersonal dynamics at work as well. Personally, I think I would prefer seeing children listed in birth order by mother, but with a separate chart showing time order in relation for father. Both ways of looking at things is important in order to understand what is going on. I suspect that those of us with situations like this will work out the presentation that works best for what we are trying to convey. No one method of presentation is going to work for every situation. My software currently only allows presentation of children one partner at a time, which I find limiting in illustrating the family dynamic. I have come to use the software primarily as a way of keeping track of what work I have done. When it comes time to write it up, even in my own notes, I present the information that makes the most sense, and create the format myself. I really prefer the first option, find the second confusing and too lengthy (although I can see using this arrangement for personal use), and the third option works for me too. I strongly prefer seeing children grouped with their mothers, and the absolute order of their birth is of secondary importance to me…although I do like the arabic numerals for subsequent generation paragraphs being in birth order. To list the children in strict birth order, with corresponding mother, somehow seems (to me) to strip away the dignity of the women and make them appear more like breeding stock, rather than individual humans. Thanks Pamela – The above options can also apply for a female who had children with different male partners in alternating order (in which case it’s the mother as the principle subject, followed the fathers of her children), although I could not find any historic examples of that (I do have some a couple of situations like that in my own genealogical files, but they regard unknown [and living] individuals). My tiny group of researchers have been going round and round as to which Mary is our grandmother. Benjamin had two wives. Both named Mary. Both referred to as Polly. Town records, historical society records, burial records, written and published Bailey genealogies do not agree. If each Mary would have had a raft of kids with a nice bunch of years between wives, our life would be so much easier. I’ve made a decision for my own tree. Two nights ago I stumbled over a Smith genealogy and there she was. Just as I thought. Not much proof. Just that one line that one time. But enough for me to leave my tree as I have it and quit looking for more “proof”. It’s not out there! 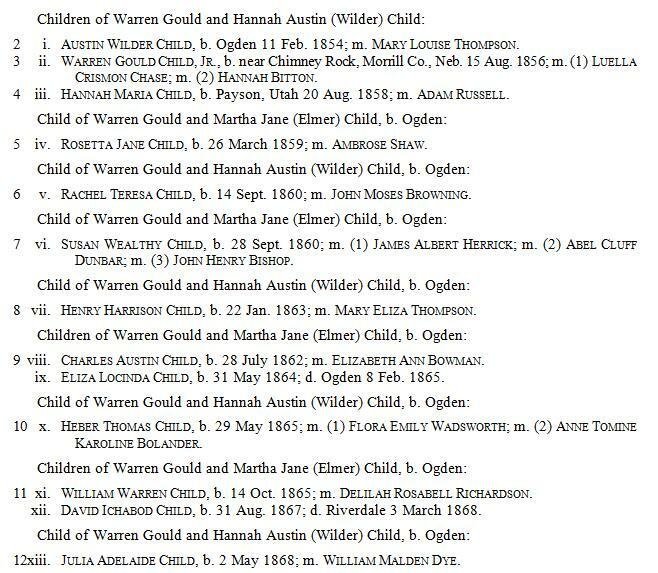 Just wondering what the story is regarding William and Elizabeth’s adoption of the children of Olive and William and Olive’s subsequent life. Did she maintain contact with her children? Did they know? Was social propriety an issue? Thanks. The book discusses all of that. The two children of Olive Byrne knew that Olive was their biological mother but they did not know that William Marston (their adopted father) was their biological father (this was apparently done at Olive’s request). William Marston died relatively early in 1947, and Elizabeth and Olive maintained a household together with Elizabeth supporting the home financially and Olive raising all of the children at home. Olive had also used the pen name of Olive Richard, and is listed as a widow in some censuses, despite never marrying, and on one of her son’s marriage announcements she was styled “Mrs. William Kendall Richard” (even though no such man existed). Elizabeth Holloway Marston told Olive’s two sons of their true paternity after Olive’s death. Olive was also the niece of noted birth control activist Margaret Sanger. See https://www.amazon.com/dp/B00K4C3QPK/ref=dp-kindle-redirect?_encoding=UTF8&btkr=1#navbar for more information on the book. Chris, at the risk of being totally daft, birth order seems implied when the date of birth is a given or “known.” For myself a traditional approach of keeping each child with each mother or father (Option A) is the most simple and easiest method to follow – though I readily acknowledge it many not indeed be the most accurate. The other options work, but either oversimplify the issue, or make it too cumbersome to work with down the road. – Great exercise!!!! My ignorance about Register style is really getting in my way here. I’ve clearly skipped over the details as I’ve read articles. I have two major problems reading how these 25 children are numbered, whichever method is used. Why, for instance, is Austin Wilder Child, b. 11 Feb 1854, labeled “i” but “2”? He’s the first born not just of his mother Hannah, but of his father. No other child of the 25 was born before him. So why isn’t he listed as “1”? Perhaps I’ve never noticed this before, but while all children have roman numerals, not all have arabic. I’m not quite sure what determines whether they are given arabic numbers. In some cases those who die young don’t get the honor of arabic numbers. 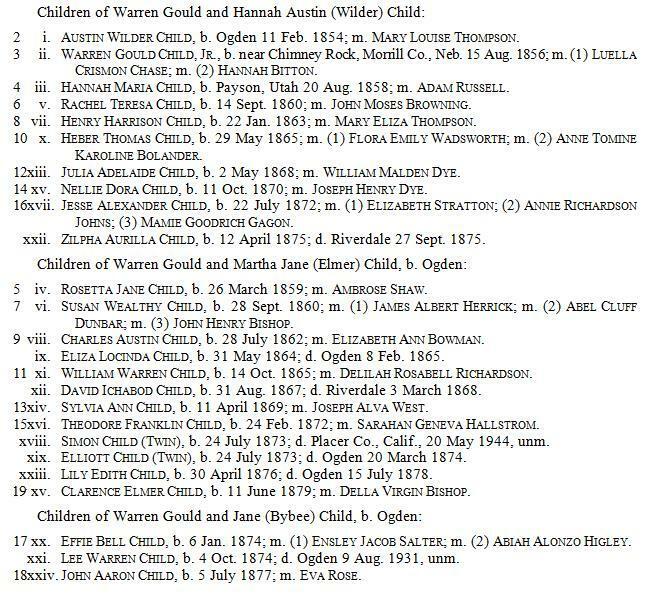 This would account for Zylpha, Hannah’s xxii’th child, not getting listed as 12. In other cases, those who die unmarried also didn’t warrant an arabic number. Thus Martha Jane’s twins Simon (xviii) and Elliott (ix) neither have arabic numbers. 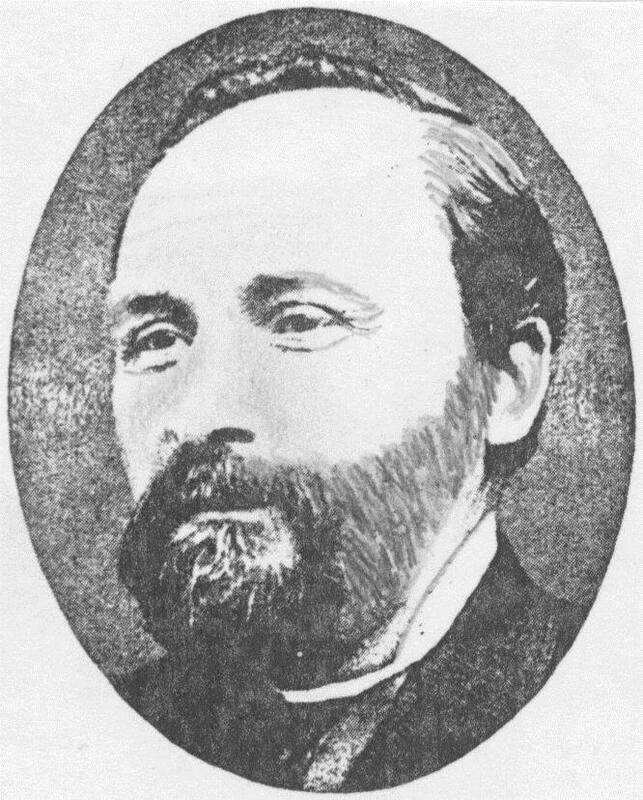 The former lived a long life, from 1873 to 1944, but died unmarried; his twin lived only a few months. In either case, neither a child dying young nor an unmarried person could produce legitimate offspring. Is that the reason Register style doesn’t grant them an arabic number? As to your specific question, I agree with Annie that the preferred method depends on the purpose. In many ways the first mode in which you’ve presented it is the clearest, with children listed under their mother. However, if one really wants to understand family dynamics, knowing the birth order of the children makes it important to have Option A available. Among other things, this makes clearer the residence and travels of the father. The family “story” is just as important as the names and dates, and being able to tease out a timeline can be helpful. My genealogical program (RootsMagic) only allows me to organize children by one parent at a time. So far it’s never occurred to me to do it by father, so all my children are listed by mother. They’re easily cross listed by father’s name as well. I haven’t found any cases of non-serial polygamy, as with the LDS, or even with the Marston case. So I don’t know what that would do to my data. Thanks for presenting a very interesting case! Sorry for my long reply. For the first part as to why Austin is listed as #2, that is because the father Warren is listed as #1. I presented this section as if it began with Warren. 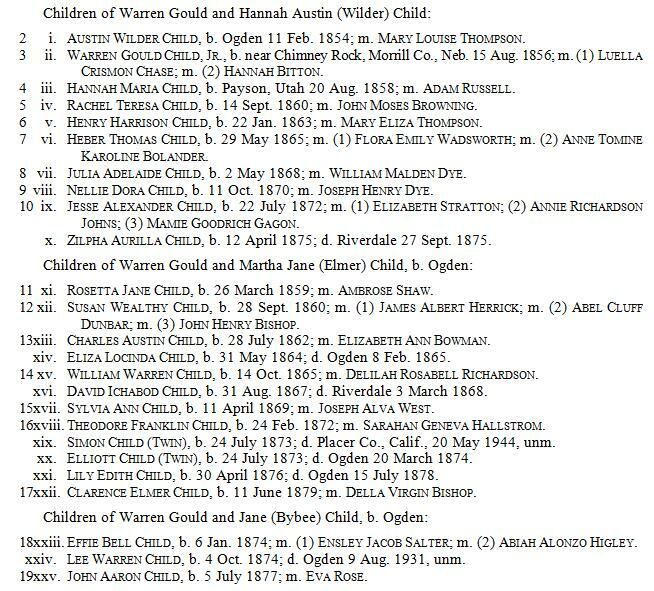 However say we began the genealogy with Warren’s father, and say Warren was the oldest child (he isn’t, but just for an example), and Warren had five younger siblings who left descendants. Warren would be #2 (his father would be #1), and then his 5 younger siblings would be numbered 3-8. Then when we got to Warren’s sketch, his son Austin would be #9, and his youngest child that left descendants (Clarence, or John depending on how you group it), would be #26. The children are given Arabic numbers when they are carried forward. Usually this would indicate they had children, but not always. In the first Marston example, Fredericka is not given an Arabic number as she died young. It wouldn’t matter if the descendant left legitimate or illegitimate children, they would still be given an Arabic number and carried forward. Sometimes genealogies will also give Arabic numbers to descendants who might not have had children, but have substantial biographical information. Scott and I did this with many descendant in our Judge John Lowell genealogy as several notable descendants lived long lives, but either married and had no children, or never married at all, but we gave them an Arabic number to elaborate on their own accomplishments. I like option B. While it’s a little more unwieldy to list the mothers multiple times, I think chronological order more clearly tells the story of the family. I prefer the simplicity of option A. By the time we get deep into any genealogy work using Register style, we will have lost any sense of chronological birth order among the myriad descendants. What your examples miss, of course, are the biographical paragraphs. Those paragraphs would be where I’d present the polygamy issues by using evidence of the way in which all the wives appear in records during the same time periods. I recently did work on the Heber Kimball Chase family. In the census, the family lived in “Big House” and Heber was the head of the family, with each wife listed below him, separately, with her children. It was a lot of fun to study this family, which also left helpful probate records.